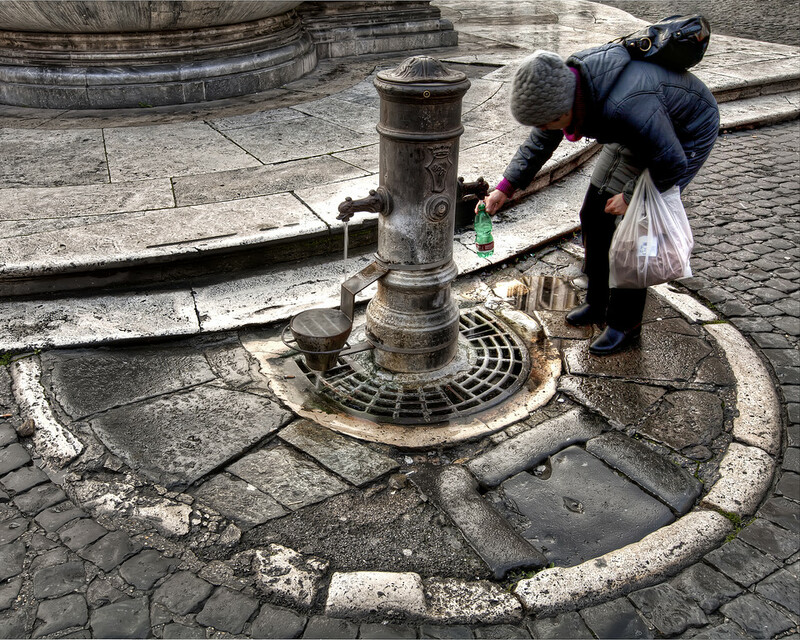 This water fountain in Rome is right next to the Pantheon. I had set this photo up exactly as it is and was just going to take a picture of the taps. Then, this woman walked up, acting completely oblivious to me, and positioned herself perfectly in the frame. I was pretty happy when I managed to get this photo on a gloomy, wet morning in Rome. Then I came across this photo taken on a much nicer morning! 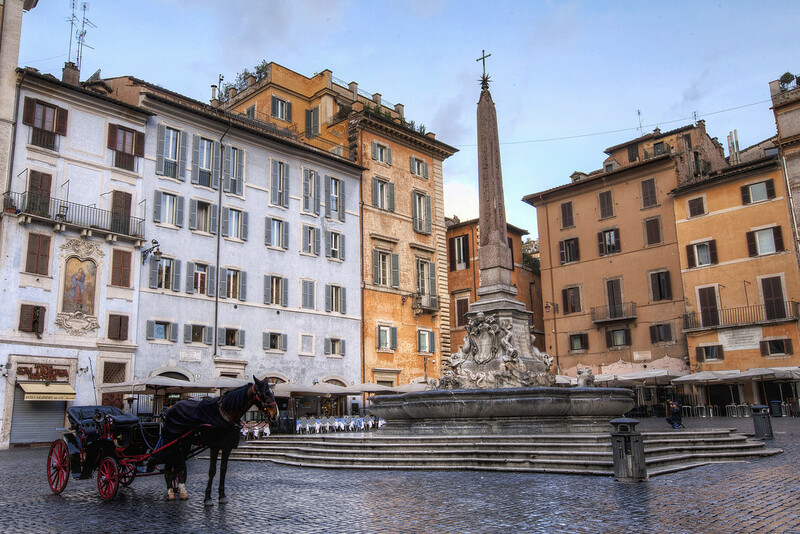 This is the first shot I took of the horse parked conveniently in the Piazza Rotunda. I’m not sure how the driver got it to stay there while he went for his morning coffee in a nearby cafe. 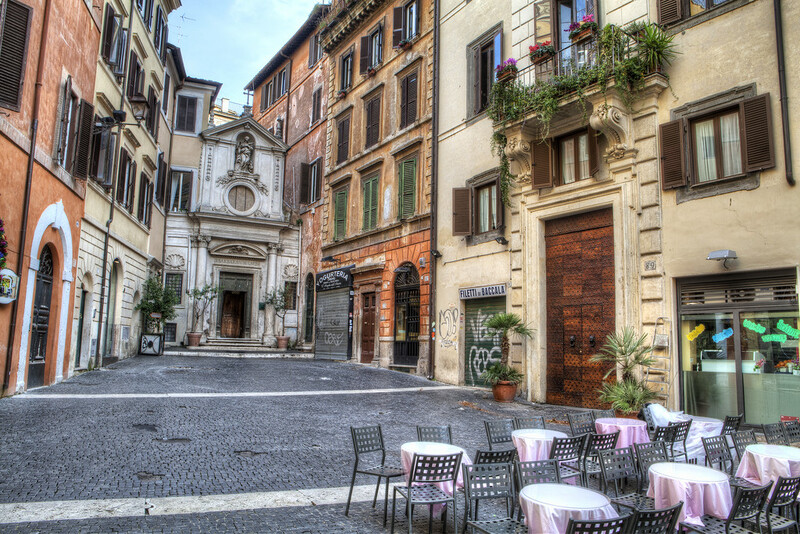 I liked this little square I stumbled upon in Rome and had planned on eating lunch there, but by lunchtime I realised my wanderings had taken me a long way away. 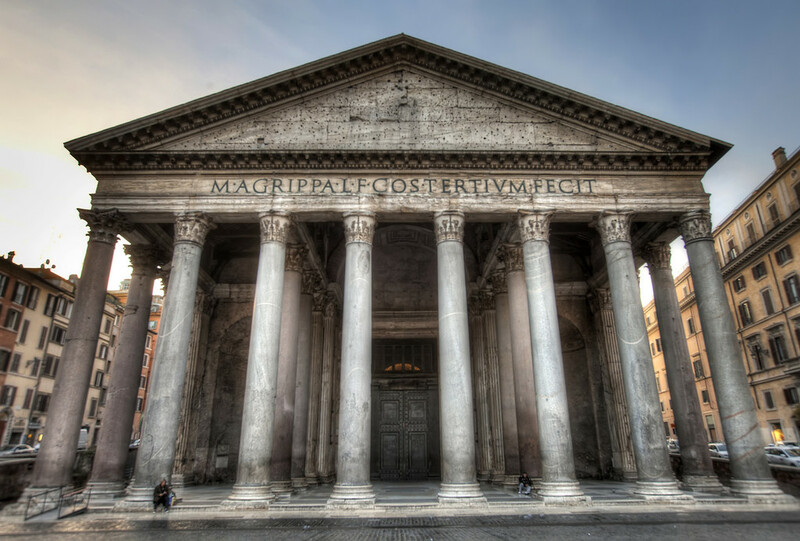 I’m not sure If I focused solely on the Pantheon’s giant doors intentionally or if it was a mistake. I like the kind of surreal feel it’s created in this image though. It seems to add to the feeling that the building is looming over you. Extra points for anyone who translates the inscription for me. An Egyptian artifact, next to a former Pagan place of worship that’s now a Christian church… there’s a lot going on in this photo. 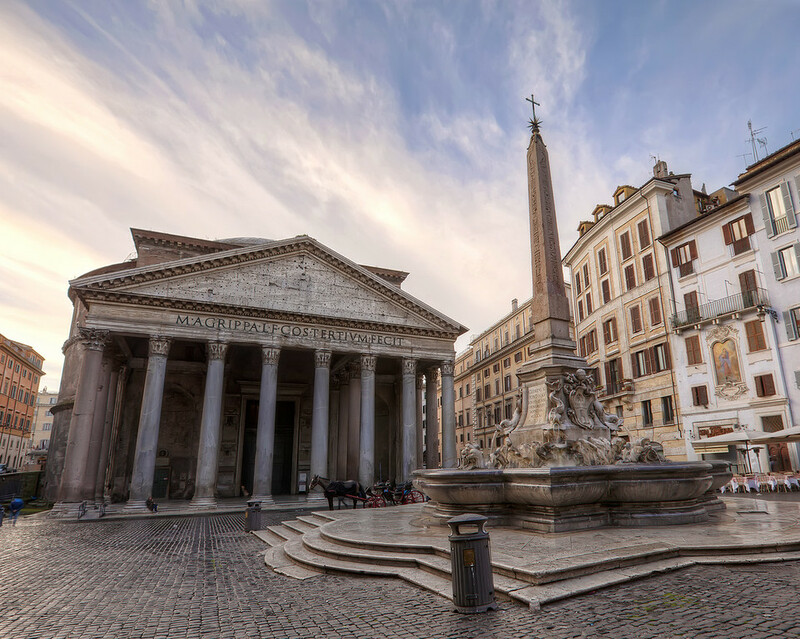 You probably recognize the Pantheon from earlier images. This obelisk, relocated from the Temple of Rome in Heliopolis, was once part of a pair. It was rediscovered in San Macuto in 1373 and found its current positioning in 1711 where it was used to add a flourish to the already present fountain. I’m not sure when the garbage bin was installed… but did they really have to put it there? There was one on each corner of the fountain too, as if they wanted to make sure the scene was nicely balanced. 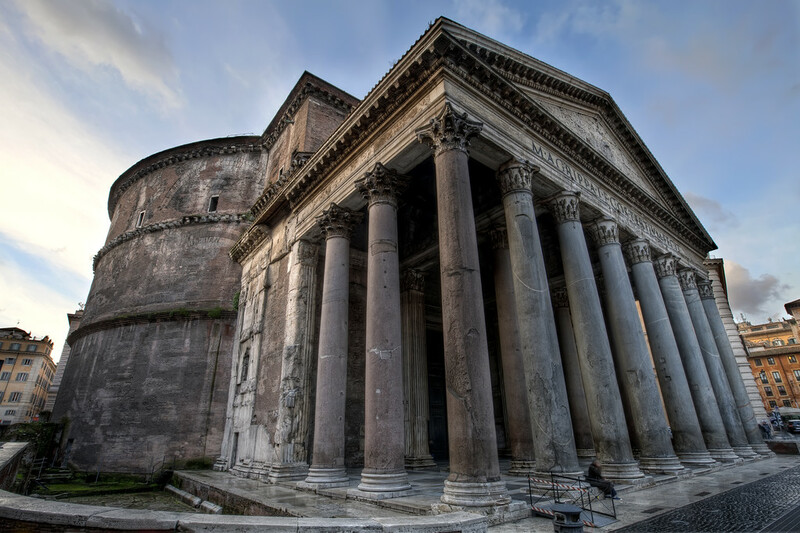 It took me quite a while to find an angle to get an oblique shot of the Pantheon showing off the amazing pillars and pediment as well as the immensity of the cylinder supporting the dome. I also had to wait for a number of people to stop chatting and move out of frame. I decided I was happy to keep the person sitting on the stairs to give you a sense of scale. I went down to the Trevi Fountain with a specific photo in mind. 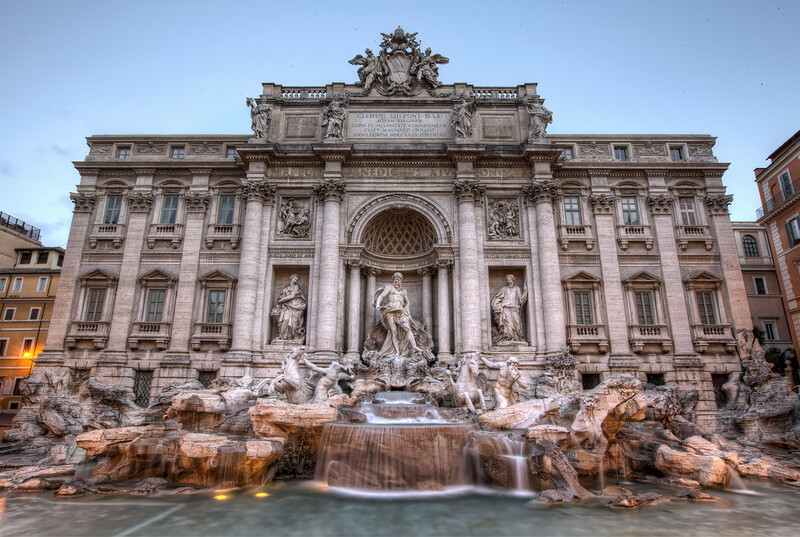 The Trevi Fountain with a lamp glowing in the foreground as the sun turned the sky a dark blue prior to breaching the horizon. After succeeding in that goal, despite competing with slick marble and worn out shoes, I set about taking a more basic photo taking in the whole thing. I realized after selling photos to the Four Seasons in Prague, for web use, that they preferred the simpler images that just showed the landmarks, so I try to remember to snap a few after taking the ones I really like. I’m starting to run low on photos from past travels! I’m going to have to start heading out at sunrise in Bermuda, and just hope the February weather decides to behave! 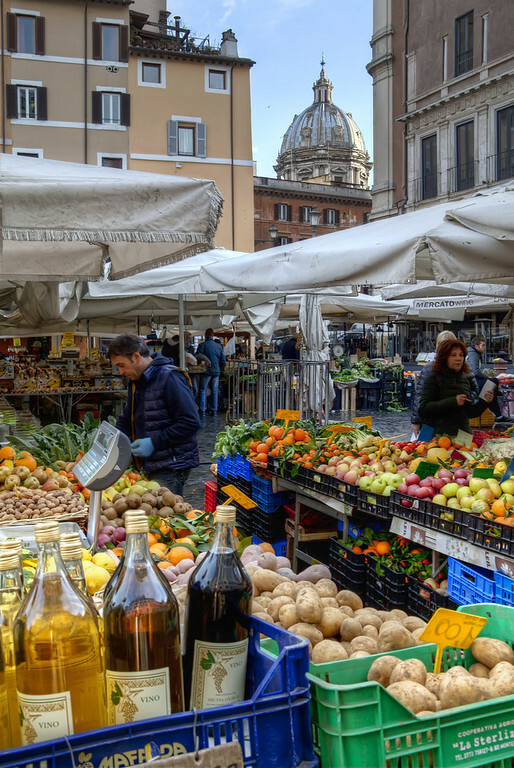 I really like photos of markets, but have never had much luck. People either look at you funny or strike poses, which puts me off a bit. This place was great as everyone just went about their business as if I wasn’t there. I really wanted to center the dome in the background between the two buildings, but there was a post in the way. No matter how hard I tried I couldn’t contort myself into a position around the pole that would let me get it centered. 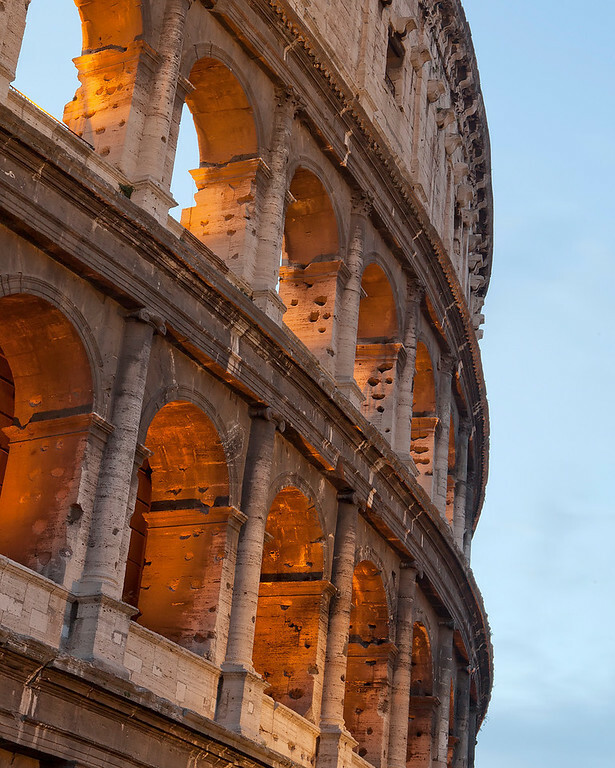 There was a lot of scaffolding up on the Colosseum when I was there, so I didn’t get to take the epic wide images I’d had in mind. Instead I had to wander round taking advantage of the areas that were left exposed.